If you're reading this in the northern half of the globe, chances are your telly was set to one channel for a few hours out of the last 24, as the Super Bowl kicked into gear for 2012. Even if you aren't a fan, you probably had to zip it in the corner while the game was on, and hold out to share the mutual rewards of the prized Super Bowl super-expensive for super-exposure commercials. Sure John Carter wins on soundtrack and husky voice over dude, but as Stark says, The Avengers "have a Hulk" - and that always counts. The Avengers ad: good, did what it needed to do without showing too much. I loved the Hulk standing alongside Cap, Thor, Iron Man, etc. Even though he still looks fake CGI I love him. John Carter: the Super Bowl ad was terrible. Showing the logo with a montage? You have to be kidding me. How does this explain the movie to non-fans? And was that Stairway to Heaven playing as the music? Now the extended trailer, which you got if you used Shazam and went to the Disney website, was much superior and I loved that. Totally stoked for the movie but I think Disney is blowing the marketing big time. the John Carter trailer doesn't look very promising indeed. as for the Avenger i'm hoping for the best but praying for the worst. i'm not sure i'm to crazy about Capt. America's "cowl". 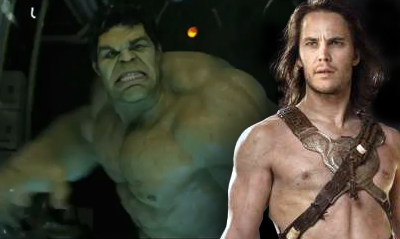 something about it doesn't quite work for me and i really hope The Hulk looks better then that in the actual movie. Thanks for the great comments guys! I'm thinking we're going to see some big time cameos toward the end of Avengers. Spidey's been leaked already, but I'm thinking Marvel's going to pull all the stops at the end, because it looks like the World's Finest may need the Cavalry to ride in. I'm hoping we get to see the likes of The Thing, Torch, Ms. Marvel, Wasp and Ant Man, Scarlet Witch, Luke Cage, Beast, and Wolverine show up to help and to give a nod to all those other Avengers that didn't make the first string. I wish Marvel had shown the full trailer. I think that one line "We've got a Hulk" would have given the spot a pop worthy of the Big Game. Hey Craig! Yeah Spidey is interesting isn't it? It's been leaked but Joss Whedon denies he's in The Avengers... still Bryan Singer also told us there would be no Wolverine in X-Men: First Class and look what happened there! I think Wasp and Giant Man are the next have-to-be characters, and I'd love them for them to bring Vision in with them, but that might be more grounds for a sequel then anything.